Collection Schedule: Make sure to place your recycling cart at the curb on pick up day by 6 AM or the night before. Recycling is picked up every week, but we suggest not setting your recycling cart out until it is at least half full. Rates do not change depending on how often you set out your recycling. Carts and Weight Limits: Recycling must be set out in your blue recycling roll cart which is supplied by Heiberg Garbage & Recycling. The weight limit on this cart is 135 lbs. All recycling can be mixed in this cart EXCEPT for glass, which needs to stay separate. Glass: Glass must be kept in a separate container for collection. 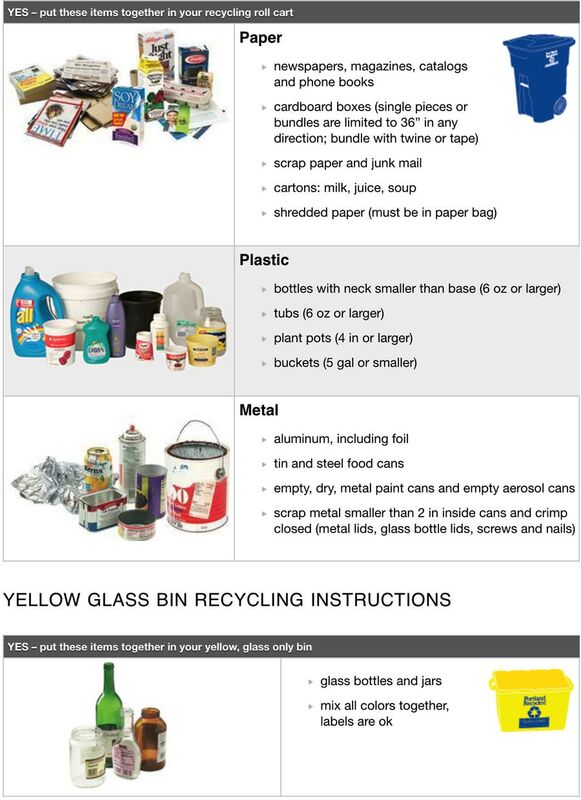 Please use your yellow bin that was supplied by Heiberg Garbage & Recycling at the start of your service. If you do not have a yellow bin, you can use a rigid container up to 5 gallons in size. Do not put glass at the curb in paper bags as if the bags get wet, they can break and leave broken glass on the ground and in the street. Plastic Bags/Lids: These items are not allowed in the curbside recycling program and are one of the biggest contaminants our drivers see in recycling carts. If you would like to find a place near you to recycle these items, please call the Metro Recycling Hotline at 503-234-3000. Extra Recycling: If you have extra recycling, this will usually be picked up at no additional charge. Cardboard boxes next to your blue recycling roll cart work great to gold extra recycling – just remember to keep any glass separate! Missed Collection: If your recycling was not picked up on your regular collection day due to the driver missing it or you forgot to set it out, please call our office within 2 business days to remedy the issue. Holiday Schedule: Our drivers work all holidays except for Christmas and New Years Day. If your collection day falls on one of those holidays, your collection day will be pushed back one day. Pick up the rest of the week will also be pushed back one day (ie normal pick up day is Thursday, holiday pick up will be Friday – normal pick up day is Friday, holiday pick up will be Saturday). Severe Weather: When collection is delayed by severe weather our first priority is to collect garbage since it is not picked up as frequently as all other materials. Heiberg Garbage & Recycling will make every effort to pick up your recycling before your next collection day. This means evening and/or weekend collection may become necessary so please make sure to leave your recycling at the curb to give us every opportunity to empty your cart. If your recycling is not able to be picked up, we will collect double the volume on your next regularly scheduled collection day at no additional charge.